I just added two new reviews to my ukulele site: the Kala Eight-String tenor and the Vorson Electric, solid-bodied tenor. One of the things I want to discuss in our upcoming CPLUG workshop is how to read tab sheet music. In this post I’ve given you some pointers so you can practice on your own. It’s worth learning to read tabs because it gives you the ability to play melodies and solo pieces without having to read music. 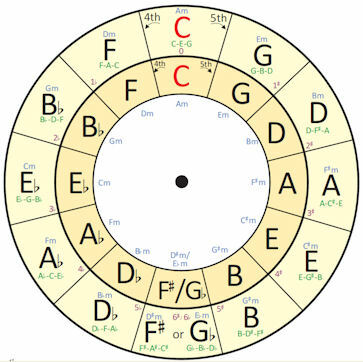 I have revised my transposing chord wheel/circle of fifths tool this week. It is now a three-ring version. You can click on the image on the right to download the PDF. The outer ring shows the Roman numerals for the key. This lets you see the chords by number – uppercase is major; lowercase is minor. Turn this wheel to the I key is above the key on the middle ring. The names in dark blue are some of the chord forms you can use in that position (i.e. I: major, major seventh). W means whole step (two frets) and H means half step (one fret) – the distance between notes for the scale. The two inner wheels show the circle of fifths, with notes for the major triads for each key in green, with the relative minors named in blue. The middle ring also shows the number of flats (b) and sharps (#) in a key signature. Fifths move clockwise; fourths counterclockwise. The inner ring is used for the key a song is in. Turn the key so that letter points to the letter of the key you want to transpose into. The chords shown on the middle ring relate to the new key. For example, if your song is C-Am-F-G and you want to play it in F, turn the inner ring so C aligns with F on the middle ring. A on the inner ring will align with D (which means Dm since the original was Am), F with Bb and G with C. So the new chords will be F-Dm-Bb-C. And in G it would be G-Em-C-D.
Print the pages, laminate those with the wheels, then cut them out, punch holes in the centres, and push a brass paper fastener through all three. Instructions are more fully described on page four. Page five is a larger version if you want something with bigger type. Print three copies of that page. Look for my chord builder wheel, too, also available free on this site. You’re welcome to use and share this tool, just please respect my copyright: don’t sell it or offer it in an package with content for sale. And don’t remove my copyright notice on the file. It’s official: the Canada Ukes ukulele festival will be held right around the corner from Collingwood: in Midland at the Midland Cultural Centre, May 22-24. Three days of ukuleleness, featuring Ralph Shaw, Stevie McNie (leader of Toronto’s Corktown Ukulele), The Skinnydippers and others. Performances, jams and workshops galore! Vendors, too. Early bird tickets for the entire weekend of activities are $148 adults and $128 student under 21; after March 31 they go up to $188 adults and $148 student. Check the official website for more and the full schedule of events. Most of the events have limits for participation, so be sure to pick those you really want to attend! “Bésame Mucho” is Spanish for Kiss Me a Lot. This romantic ballad was written in 1940 by the Mexican songwriter, Consuelo Velázquez and quickly became a popular tune in both Latin and North America. It is also translated as Kiss Me Much, and Kiss Me Again and Again. Wikipedia says Consuelo had never yet been kissed when she wrote the song! I wonder how long that lasted. By the way, they failed the audition and Decca never signed them. Maybe it’s because they did it at such a fast tempo, it loses its romantic feel. The words were translated by American composer and singer Sunny Skylar. It reached audiences worldwide from 1944, and became an international hit following its appearance in the film Follow The Boys. The song didn’t stay in the band’s repertoire for very long, however. It was reprised in 1969 during the Get Back sessions and a version is heard in the Let It Be film. I just returned from Orangeville where Broadway Music hosted a two-and-a-half hour musical workshop this Saturday by Manitoba Hal today (which will be followed by his concert tonight from 8-11 p.m. – try to attend, if you can: he’s very talented). Very informative and well worth attending. Interestingly, at least half the participants were my age, and I didn’t see anyone in the classroom under 40. Perhaps you have to be mature in order to really appreciate music this way, not simply as the soundtrack in the background. Hal spoke to the group about a basic approach to understanding music theory – chords, chord construction, scales and the all-important Circle of Fifths. He also spoke about how to put it all together to both make music and to figure out song arrangements for yourself (something dear to my own heart as I struggle to arrange songs for our local group). He built it up from the basics in a way almost anyone, regardless of musical education, could understand. Most of it I knew from my reading, but Hal make it so much easier and clearer than the textbooks I’ve been reading. In 1902 Handy traveled throughout Mississippi, where he listened to the various black popular musical styles. The state was mostly rural, and music was part of the culture, especially of the Mississippi Delta cotton plantation areas. Musicians usually played the guitar, banjo and to a much lesser extent, the piano. Handy’s remarkable memory enabled him to recall and transcribe the music heard in his travels. It was the first commercially successful blues song, although blues had long been a style of music before then. Handy dressed it up somewhat with the musical influences he had picked up, including some ragtime and Dixieland overtones. Perhaps the best known performance of the song was recorded by the great Bessie Smith in 1925, backed by a young Louis Armstrong. Smith appeared in a 1929 talkie called St. Louis Blues – apparently her only appearance in film – in which she sang the title song as well, with an orchestra and chorus that gives the song a strong gospel overtone. You can watch it here: Youtube. I first heard this song back in the 1960s, and it was a staple among folk and acoustic blues singers back then. I recall seeing Sonny Terry and Brownie McGhee (the actual songwriter) do it together at Convocation Hall, in Toronto, in the 70s. I can’t remember if it was in the set list when I saw Dave Van Ronk in Ottawa, in the late 60s, but I believe so. This Sporting Life, as it is also known, was a popular song for jam sessions, too, when I was playing a lot of guitar, in the 60s through the 80s. Over the years it seems to have accumulated a lot of different verses as well as variations on those verses, but the ones I have written out are those I remember. It’s a pretty straight-forward blues song and uses pretty much the same chord pattern used in the song, Cocaine Blues, which I will cover in a later post.